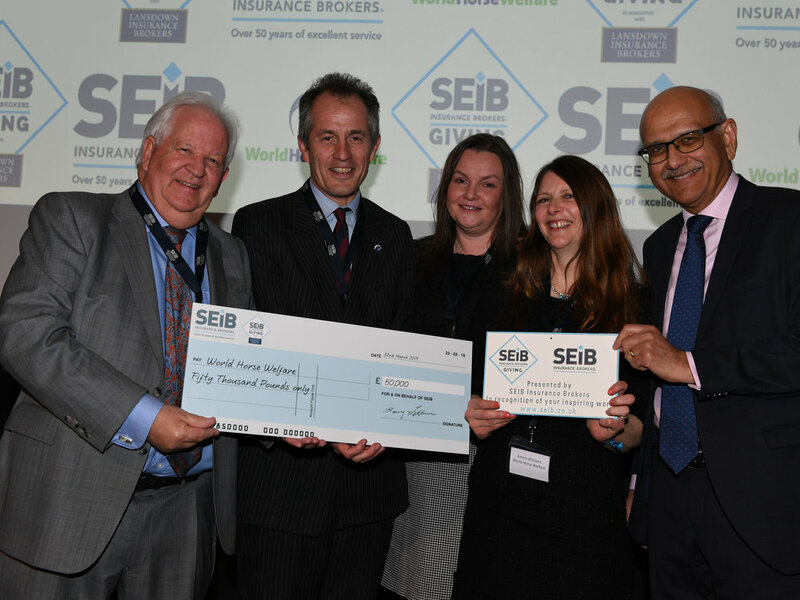 SEIB Insurance Brokers has granted a total of £100,000 to charity at their Charity Awards luncheon held at the Grange City Hotel, London on 22 March. Barry Fehler, SEIB’s chief executive officer, presented the £50,000 cheque and a commemorative plaque to Roly Owers and Emma Williams of the winning charity, World Horse Welfare. Nine other charities reached the final voting stage of the SEIB Charity Awards and received a further £50,000 between them. World Horse Welfare plan to put the money towards vital new equipment, including a new tractor and trailer and a drone with a hi-res camera to help locate horses in need of help in hard to reach locations. Redwings Horse Sanctuary took the runner-up grant of £15,000 to go towards their new horse hospital treatment room and the Welsh Pony Rescue and Rehoming Charitable Trust, the smallest charity of the finalists, got £10,000. The Animal Health Trust were awarded a grant of £5,000 for a digital x-ray to could help diagnose new orthopaedic conditions. Over 1,000 small to medium sized charities were nominated by over 22,000 public votes in the first stage. From these charities, a shortlist of finalists were selected and invited to submit detailed plans. Following this, SEIB customers placed nearly 2,000 votes to decide on the recipient of the £50,000 grant and the runners up.